First Draft of Richmond's Public Art Master Plan Released | Arts and Culture | Style Weekly - Richmond, VA local news, arts, and events. 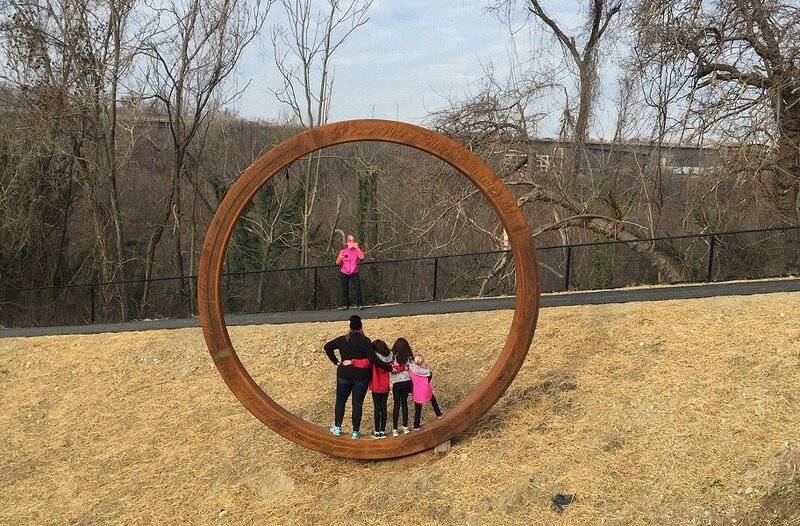 People take a photo inside one of artist Josh Wiener's rings, part of Richmond's latest public art installment at the south entrance of the T. Tyler Potterfield Memorial Bridge. The public art commission and the city’s public art coordinator, Ellyn Parker, hired consultants Gail Goldman and Gretchen Freeman to develop the plan. A series of public meetings were held and survey input was collected in 2015 and 2016. Goldman and Freeman are from San Diego and Phoenix, respectively, and received $150,000 to develop the plan. They also created public art master plans for Calgary, Canada, and San Antonio, TX.